Cattle welfare … haven’t seen any Angus heifers at the grocery store lately buying sweet feed for their offspring with SNAP benefits, have you? No wonder when consumers hear the words cattle and welfare the image isn’t always positive, but we can change that! This industry has producers who are truly passionate about what they do and how they do it each and every day. This past week I visited an operation in Tennessee to walk through the AngusSource® Cattle Care and Handling guidelines that producers can opt to use when they enroll in AngusSource. Bet you are shaking your head wondering why anyone would want to pay money to document they know how to take care of their cattle. That’s a fair statement because seriously most every farmer and rancher takes as good of care of their cattle as they do their kids. Sometimes the cattle have it better. But it’s no different with cattle than with kids. Sometimes each of them need a better place to live than where they are living at that time. It’s late on a Saturday night. Your teenager is out with friends, and it is below zero. They are late and have not called. Your mind doesn’t always think of the good time they are having with their friends. Unfortunately, you wonder about the many other things that could be wrong. Consumers are no different. It’s the unknown. No matter if it is your teenager, animals or an event that has recently happened, when we can’t find out the information we want or see the whole story for ourselves, our minds seem to come up with an illogical solution. That is why. AngusSource Cattle Care and Handling is one of the five verification options offered under the AngusSource umbrella. Producers must have recently been Beef Quality Assurance (BQA)-certified. It’s another way to help bridge the gap from producer to consumer. This Tennessee operation used an existing barn to put in a cattle-handling facility that was designed with the animals in mind. The concrete was scored and sloped so manure easily moves to the installed drainage system. The sweep tub was outfitted with rubber to keep the noise to a minimum. The solid-sided, S-curved alleyway is adjustable with multiple slide gates to keep cattle from bunching up. One of the requirements of the AngusSource Cattle Care and Handling Process-Verified Program (PVP) point is to examine the working facilities. Safety for cattle and humans is the biggest concern. Most everyone who has worked many cattle has had a close call or two. It is important to keep not only the animals in mind, but also the men and women who work the cattle. The previously mentioned Tennessee operation I recently visited used an existing barn to put in a cattle-handling facility that was designed with the animals in mind. The concrete was scored and sloped so manure easily moves to the installed drainage system. The sweep tub was outfitted with rubber to keep the noise to a minimum. The solid-sided, S-curved alleyway is adjustable with multiple slide gates to keep cattle from bunching up. The biggest asset was the outside handling facilities to sort cattle. As the animals came out of the chute, they had the option to be sorted six ways. The setup kept those working the cattle safe, too. A subject no one wants to talk about is when an animal gets down. What do you do? This producer looked down shaking his head. I knew there was a story. His favorite bull this past year got hurt out in the pasture. The bull just wasn’t going to be able to have a quality life. It was obvious he truly loves his animals from his reaction. He said he had to call the vet to come put the bull down. He just couldn’t do it. I don’t find many producers who don’t have that type of passion for their animals. They love them. They get attached to them. They want their cattle to be healthy and to be treated well. Every chance you get, tell a consumer about your passion. Tell them your story. Consumers need confidence in their food supply. A source of confidence is AngusSource. Call to enroll today, 816-383-5100 or visit www.angussource.com. Editor’s note: Ginette Gottswiller is the director of commercial programs for the American Angus Association. Veterinarian offers advice on dealing with complicated births. Preparing for spring calving season. Effects from shutdown and policy discussed. NCBA advocates for protection of species-specific terms used to describe meat products. Says agriculture’s three priorities are trade, trade, trade. Some food allergies really aren’t food allergies. From applying the right amount of pressure to knowing when to call the vet, these tips help save calves. Art Douglas explains what weakening El Niño means for ranchers across the country. Rainy days lead to muddy, thinner cows. Tools available to help convert pastures. Technologies demonstrated at NCBA Trade Show. Giving injections to calves requires certain considerations. Our team of Angus advisors offer regional tips for herd management for the winter season. Changing traditional practices to preserve traditional values. Vaccinating cows is best protection for young calves. Reduce exposure to pathogens and increase immunity. 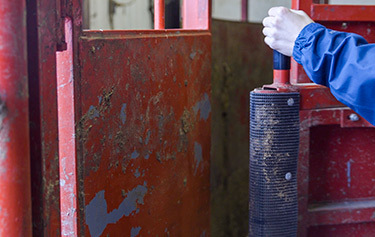 Three components of biosecurity crucial to preventing disease. How to give multitasking mamas an added nutritional boost. Passive immune status within 24 hours of birth and long-term health and performance of calves. Forage sorghum silage viable option with sugarcane aphid control. Industry expected to remain profitable with strong markets. Feeder-cattle prices discounted to fed. Export demand plays role in feedstuffs outlook. Cattle market continues on an upward trajectory based on weather market. Confluence of key factors suggest downside economic risk. Charleston’s McBeath aims to prepare the best beef.